At a late October council meeting, a protester calls for a new vote on the Entergy New Orleans power plant. 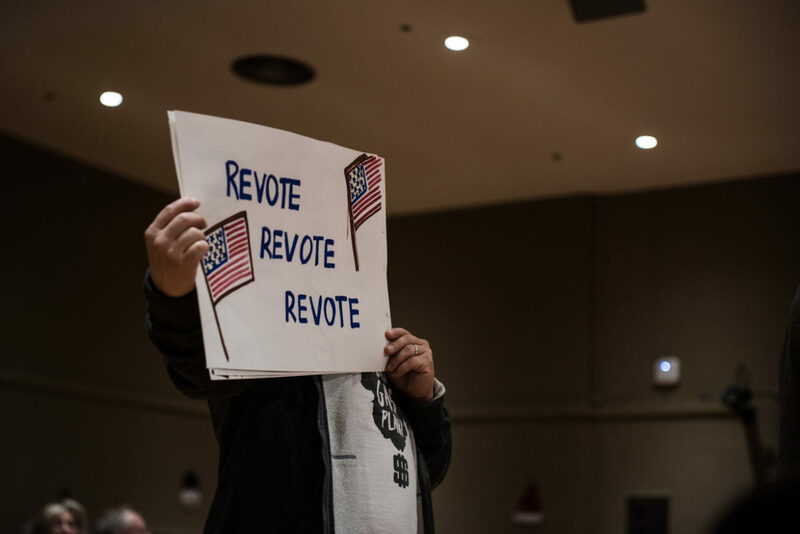 At a December City Council utility committee meeting, a protester calls for a new vote on Entergy’s proposed New Orleans power plant. The council voted to approve the plant in March 2018. But after a lawsuit and a scandal over the use of paid supporters, council members plan to offer a proposal to reconsider the vote. Editor’s note: This story has been updated with details from Councilwoman Helena Moreno’s office on the substance of the power plant resolution that she and other council members plan to introduce. Three New Orleans City Council members will introduce a resolution next week to “rescind and repeal” the council’s March 2018 approval of Entergy New Orleans’ proposed $211 million power plant in eastern New Orleans, Councilwoman Helena Moreno’s Chief of Staff Andrew Tuozzolo confirmed Thursday night. Tuozzolo said the proposed revote on the New Orleans Power Station was prompted by the revelation that actors were paid to appear at City Council meetings and express support for the plant, which was opposed by neighborhood groups and environmental activists. The resolution will be introduced at a specially called meeting of the full council set for Wednesday. It is sponsored by Moreno — who chairs the council committee that regulates Entergy — Councilman Jason Williams and Councilman Jared Brossett. Earlier this week, a lawsuit, filed last year by a coalition of environmental and consumer advocacy organizations demanding the council vacate the 6-1 vote approving the plant, was put on hold. In a letter to Judge Piper D. Griffin last week, one of the council’s attorneys, Jay Beatmann, said that their request to pause the suit was unopposed, meaning that before sending the letter, he had to convince the plaintiffs’ attorney, Monique Harden. The “matter before the judge” in this case is whether to uphold or reverse the council’s approval of Entergy’s application to build the plant. If the original plant vote is repealed, Tuozzolo said, the council members plan to offer another resolution directing Entergy to enter a new application “considering a full range of options” to improve service and transmission reliability for the city. Entergy has argued that the new plant was necessary to mitigate a potentially catastrophic transmission failure. Opponents of the plant have criticized the process that led to the vote last March, saying the City Council and its advisers, who recommended building the plant, didn’t consider alternative solutions that would cost less and avoid polluting eastern New Orleans. “We don’t believe a revote on a power plant that is vital to New Orleans is either legal or appropriate,” an Entergy spokesman said in an emailed statement on Thursday. Tuozzolo said the council will also use the special meeting to vote on a potential $5 million fine on Entergy for its alleged role in the paid-actor scheme. The council initiated the process to impose the fine at a meeting in October after an independent investigation found that Entergy “knew or should have known” that one of its subcontractors was paying actors to deliver pre-written speeches at council meetings. The Council gave Entergy 30 days to defend itself. In November, Entergy submitted its response, saying that “the Council does not have authority to impose a $5 million fine” and describing the investigation’s conclusions as “inflammatory and misleading accusations.” Entergy did, however, offer to “donate” $5 million to the City of New Orleans in place of a fine. At that same October meeting, council members provided the first hint that they might consider overturning the plant vote. Brossett and Williams, the only two current council members who were in office last March to vote on Energy’s application, said they were open to a revote. Both voted in favor of the plant last March. On Wednesday, prior to full details of the meeting being released, Harden told The Lens that the council can expect power plant opponents will be at the City Council chamber next week to push for a revote. “The gas plant is on the agenda, so people are coming,” she said. This story was updated after publication to include comments from Entergy and additional details about next week’s meeting.